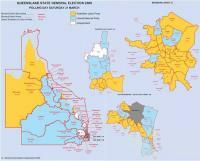 It’s said that things don’t change much or too quickly in Queensland – yet in the space of eleven years, the State’s electoral map changed shades from a dominant orange to a sea of blue, underlining the sometimes yawning separation between political fortunes and realities in the electorate. Premier Peter Beattie watched in late 2000 as his slender parliamentary majority slipped into minority, with the resignations of three Labor MPs – including his Deputy Premier, Jim Elder – in the wake of revelations from the Shepherdson Inquiry into electoral fraud. Rather than hold off the electorate’s judgement, the Premier headed to the polls early and launched into a presidential-style campaign that focused on his leadership credentials and trustworthiness. On 17 February 2001, despite his party being in some disarray around him, Beattie led his first-term government to a resounding State election victory, winning 66 of 89 seats with almost 49 per cent of the primary vote and 60 per cent of the two party preferred vote. This ranks as Labor’s biggest electoral win in Queensland, equalled statistically only by William Forgan Smith’s 1935 poll victory. The 2001 win realised a 10 per cent swing to the government and a 50 per cent increase in its parliamentary representation from the 1998 election outcome. The result had many in the media and the State’s Opposition wondering aloud how Beattie had managed not only to survive, but ‘thrive’ after the Shepherdson Inquiry fallout. Every major swing comes at the expense of opponents. Unsurprisingly, the two major conservative parties suffered their worst ever electoral returns, with the National and Liberal Parties each polling just over 14 per cent of the State’s primary vote. This left Rob Borbidge’s Coalition holding only 15 of its previous 32 seats, the Nationals retaining 12 of 23 electorates and the Liberals three of their nine. The magnitude of the loss was too much for the Coalition to bear, with the two parties splitting and again going their separate ways; within a fortnight of the poll, neither party’s leader remained in his position. 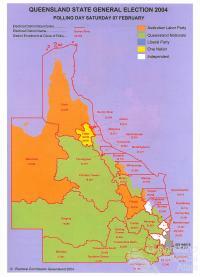 Significantly, Pauline Hanson’s One Nation Party saw its primary vote drop markedly from 22.7 per cent in 1998 to 8.7 per cent, and its parliamentary representation – decimated by defections to the newly-formed City Country Alliance or to sit instead as Independents – reduced from 11 seats to just three. These startling numbers equated to a lop-sided parliament where ALP members outnumbered their opponents by practically three to one. 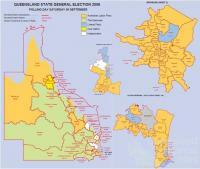 Swathes of electoral territory usually considered the reserve of the Coalition parties, from the Gold and Sunshine Coasts to inland northern Queensland, were captured by Labor at the February 2001 poll. 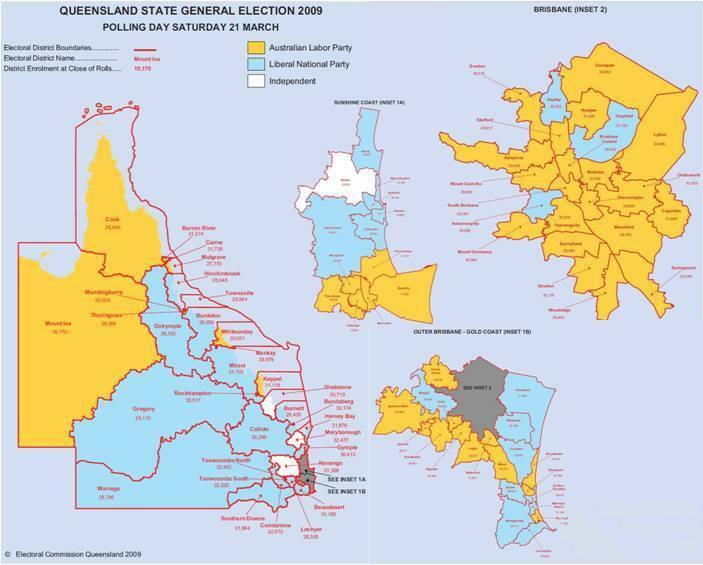 The party almost completely dominated the State’s south-east corner, with the electoral map awash there with ALP orange – Labor won all but one seat in greater Brisbane, all but two seats on the Gold Coast and all but three on the Sunshine Coast. Some of these seats had never before elected a non-conservative candidate, with Beattie paying tribute in his victory speech to those Queenslanders who ‘voted Labor today for the first time in their lives’. Voting swings to the government in some of these surprise ALP gains were even more pronounced than the State-wide figure: the Nationals stronghold of Southport on the Gold Coast recorded a 13.9 per cent swing to Labor in the two party preferred vote; the Liberals domain of Noosa on the Sunshine Coast saw an 11.3 per cent swing; Aspley and Clayfield in Brisbane’s northern suburbs swung 6.7 per cent and 8.5 per cent respectively; while Burdekin in the State’s north recorded a 14 per cent swing. 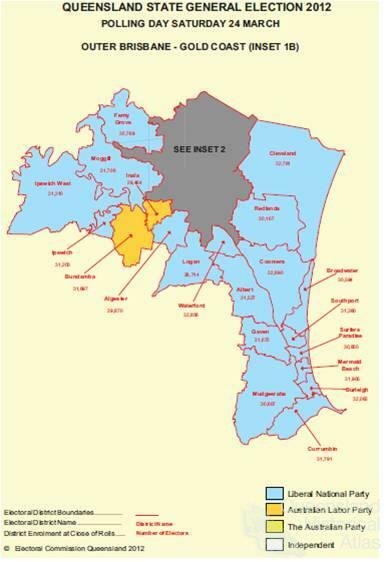 Electorates in the coastal strips either side of Brisbane, and those especially in the urbanised fringes of the capital, had in the previous decade become increasingly populated by younger, more skilled and higher educated voters. This growing, ‘aspirational’ demographic, largely a result of huge interstate migration, showed a propensity to shun the more extreme policies emanating from the likes of One Nation and some quarters of the main conservative parties, and gravitated towards Labor’s more mainstream electoral appeal – writ large in Beattie’s ambitious, jobs-focused ‘Smart State’ agenda. Similarly, many inhabitants of regional electorates had grown frustrated with the inability of the State Coalition to negate certain unpopular policies of their Federal counterparts. Through his popular Community Cabinet forums, Beattie had shown a willingness to give these voters’ concerns the airing they felt was denied them by the conservative parties. 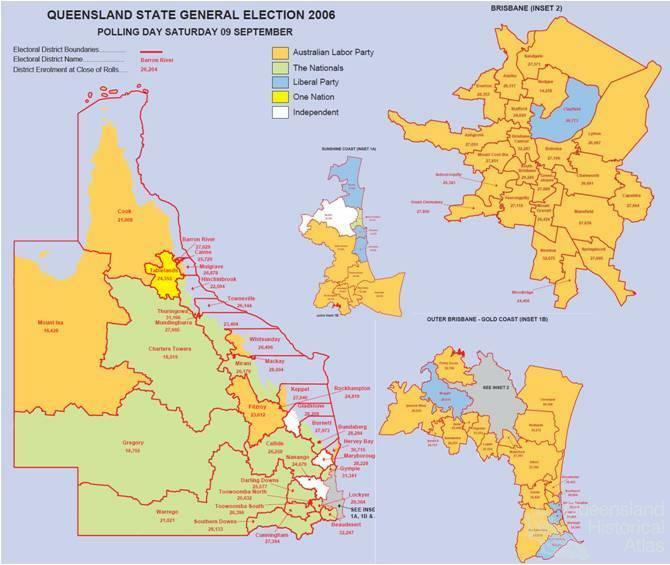 The 2001 election victory, attributed by some to Beattie’s populist, ‘strong leader’ appeal and by others to his shrewd ‘just vote 1’ campaign slogan (taking advantage of Queensland’s optional preferential voting system), set up the ALP for an electoral dynasty not enjoyed by non-conservatives in Queensland for nearly half a century. In the years following, Beattie easily won State elections in 2004 and 2006, with his huge parliamentary majority whittled down by only three seats (most in north Queensland) and four seats (most on the Sunshine Coast) respectively. The Premier’s magic touch at the ballot box seemed largely undiminished in this time going by the negligible swings against his government, and his enduring ‘everyman’ appeal in the electorate – while tarnished by controversies like the so-called ‘Dr Death’ scandal at Bundaberg Base Hospital – had some labelling him ‘Premier for life’. 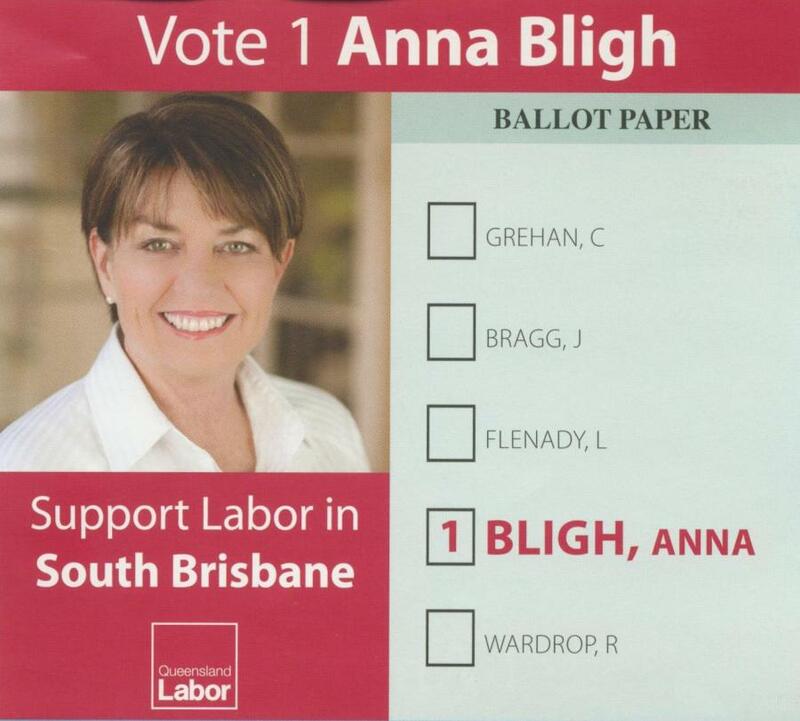 Yet in 2007 Labor’s leadership underwent an historic transition from Beattie to his deputy Anna Bligh, with the new Premier later becoming the first popularly elected female State leader in the nation’s history after her 2009 election victory. That win came at a cost, however, of eight more seats (half of these in Brisbane) lost to the newly-formed and united Liberal-National Party (LNP) Opposition, which then saw itself within touching distance of the government benches. Three years and a series of administrative and policy bungles later (not to mention natural disasters and a global finance crash), the State election of 24 March 2012 saw the ALP voted out of office in a landslide win for its LNP opponent. This election marked only the seventh time in the previous hundred years that Queenslanders voted for a change of State government; regardless, at this poll voters opted for change on an unprecedented scale. 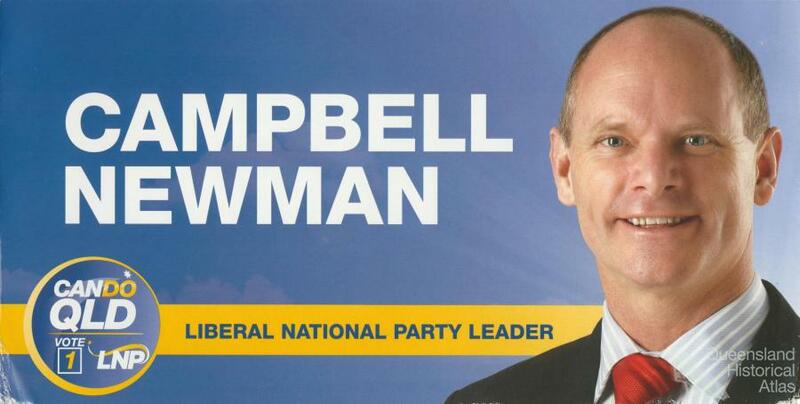 Amalgamated as a single conservative force in mid-2008 under the stewardship of former Nationals leader Lawrence Springborg, by 2011 the LNP hierarchy believed that Brisbane’s Liberal Lord Mayor, Campbell Newman, as leader held the key to winning over voters in the capital. Ultimately, the party enjoyed a popular surge of support across the whole State and at the 2012 election won a record 78 seats – almost 88 per cent of the parliament – with over 49 per cent of the primary vote and almost 63 per cent of the two party preferred vote. Interestingly, the colourful Australian Party of Bob Katter Jnr, attempting to replicate One Nation’s wrecking job at the 1998 State poll, attracted a creditable 11.5 per cent of the vote but could only equal its lot of two seats; of five Independents heading in to the election, only two survived. Labor was left demolished with a mere seven seats – out of 51 going in to the poll – from over 26 per cent of the primary vote, giving up 43 electorates to a rampaging LNP. 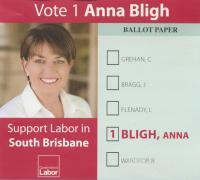 Like the Keneally Labor administration in New South Wales one year before, Bligh’s ALP government suffered a massive, record swing against it of 15.6 per cent, making it the worst defeat for an incumbent government (at least in terms of number of seats lost) in the State’s history – though, ironically, enduring practically an identical negative swing as befell Russell Cooper’s National Party government in December 1989. Similar to results at the 2001 poll, seats changed hands at this election which had never before (or hardly ever) been out of Labor’s grasp: Brisbane Central, held since its inception in 1977; Bulimba in Brisbane’s inner east, held since 1932; Cairns in the far north, held since 1912; Lytton in Brisbane’s east, held since its inception in 1972; Nudgee in Brisbane’s north-east, held since its inception in 1960; and Mundingburra on Townsville’s outskirts, in Labor hands since its inception in 1912 (besides the 1996-98 ‘interregnum’ when the by-election there handed government to Rob Borbidge’s Coalition). 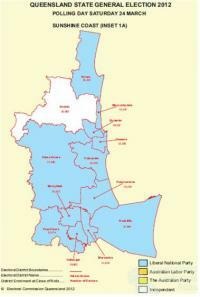 The Brisbane ‘citadel’, where since 1989 Labor had won at least 30 seats at every election, was an ALP wasteland. The average swing against the government recorded across the capital was 14.7 per cent, nearly as large as the State-wide figure – even the Premier, sitting comfortably on a 15 per cent margin in her South Brisbane electorate, ‘scraped’ home to win after a 10 per cent swing against her. Strikingly, all bar six electorates in the State’s populous south-east – counting long-standing Independents Liz Cunningham in Gladstone and Peter Wellington in the Sunshine Coast hinterland seat of Nicklin – became bathed in LNP blue. 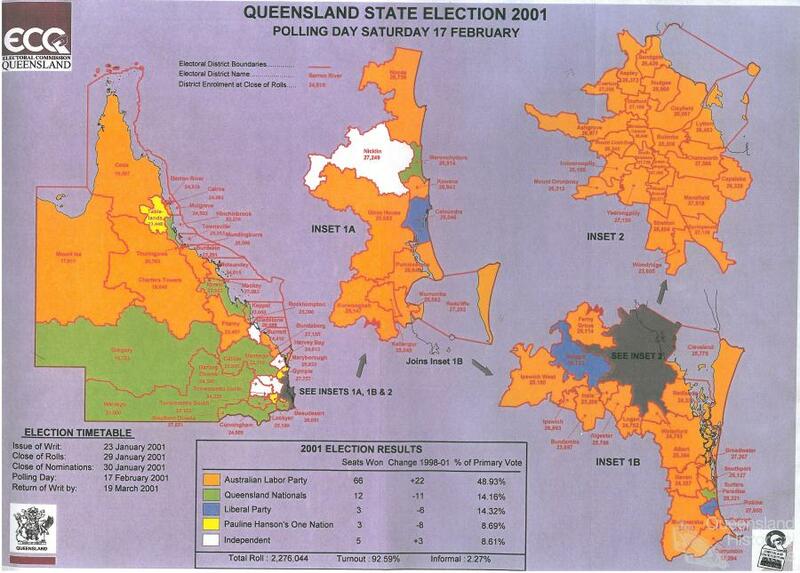 While Labor’s 2001 victory can be seen as the electorate’s ringing endorsement of Beattie personally (and a repudiation of the State Coalition’s quibbling over preference deals with One Nation), the 2012 result represented an emphatic rejection of the ruling Labor Party and what was portrayed – ad nauseum in a highly critical print media – as its ‘endemic’ and ‘epic’ failings of administration. As the saying goes, ‘oppositions don’t win elections, governments lose them.’ Perhaps underlining the merit of this adage, 11 out of 18 Ministers in Bligh’s Cabinet lost their seats to first-time LNP challengers, with three more Ministers retiring at the poll and Bligh resigning her seat the day after the disastrous result. 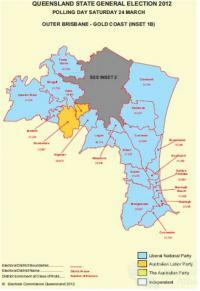 Significantly, eight of these Ministerial losses were in Brisbane electorates. Critical to the LNP’s election chances was its performance in the State capital, long seen as the bulwark of Labor’s voting base and the glittering electoral prize that had eluded the conservative parties since the 1986 election. 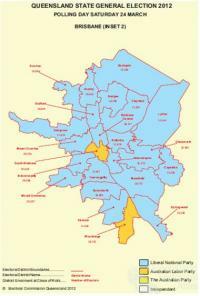 Going in to the 2012 poll holding only six of 40 seats in the greater Brisbane metropolitan area, the LNP emerged victorious in all but four of them. 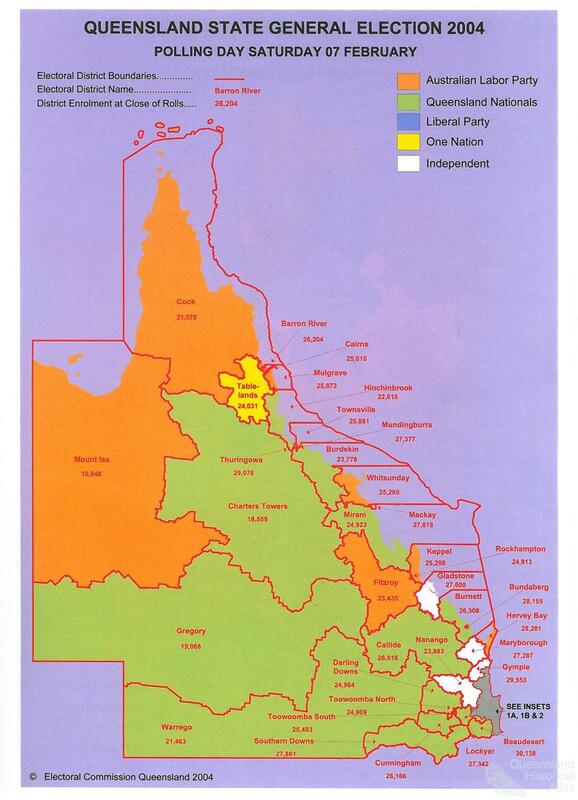 To top it off, the party won every seat on the Gold Coast, every capital city seat north of the Brisbane River and, discounting a handful of provincial seats retained by Labor or Independents, virtually an unbroken string of electorates running the length of the State’s coastline. 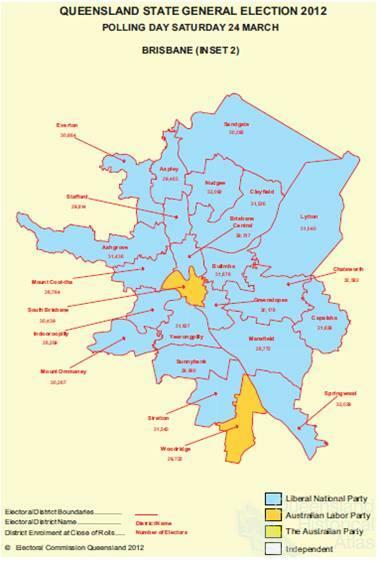 Interestingly, the voters of Ashgrove in Brisbane’s inner north-west, a seat held safely by Labor for over 22 years, elected a new member and the new Premier from ‘outside’ the State’s parliament – a first at any Australian election. It remains a matter of interest whether this strategy will establish a precedent followed in any other State or Federal jurisdictions. It also remains to be seen whether Newman can cultivate the same ‘love affair’ with the wider electorate that Beattie had largely enjoyed – although early opinion polls following his government’s razor gang approach to public sector restructuring might suggest that the new Premier will have a harder time of that. Still, in a fittingly synonymous gesture on election night that echoed Beattie’s sentiments 11 years earlier, Newman thanked those voters who had never before supported the LNP – or, presumably, its forerunners. Surging anti-Labor sentiment, fuelled by evidently reneged promises on the sale of State assets and a list of administrative errors headed by the Health Department’s payroll fiasco (and an undoubted ‘it’s time’ factor after more than 20 years in office since 1989), allowed a disciplined LNP to dominate every region across the State. 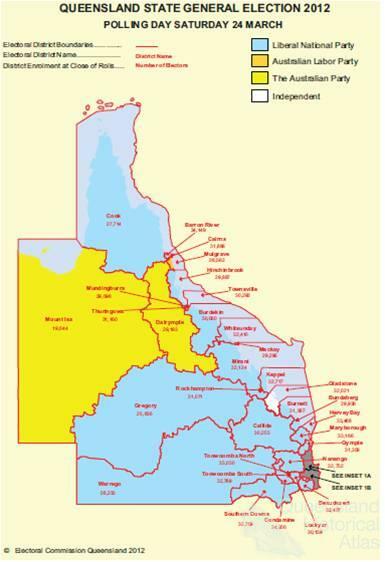 Even more so than the pre-election polls and punditry led most to believe, this categorical change in government was in many ways an unheralded – and in the end perhaps unrepeatable – electoral wipeout that no doubt had many reverting to the well-worn refrain, ‘only in Queensland’.